Hero loves jigsaws – and whereas I really didn’t think much of jigsaw time when the other two boys were little, seeing Hero figure out where pieces go is so much fun for us in the afternoons or in the mornings before pre-school when I’m having a cup of tea. Maybe it’s because he’s our final baby, but he’s much more relaxed about life in general and loves to just relax with a good puzzle, haha. This week we’ve been playing with a few puzzles, and so here’ sour first, the PJ Masks Puzzles. 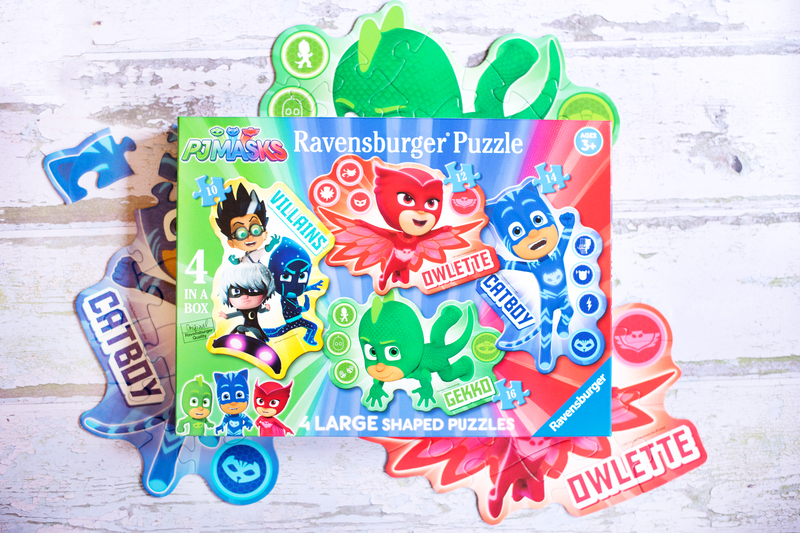 The four puzzle set contains shaped puzzles featuring Romeo, Luna Girl and Night Ninja in a ten piece puzzle, Owlette in 12 pieces, Cat Boy in 14 and Gekko in 16. 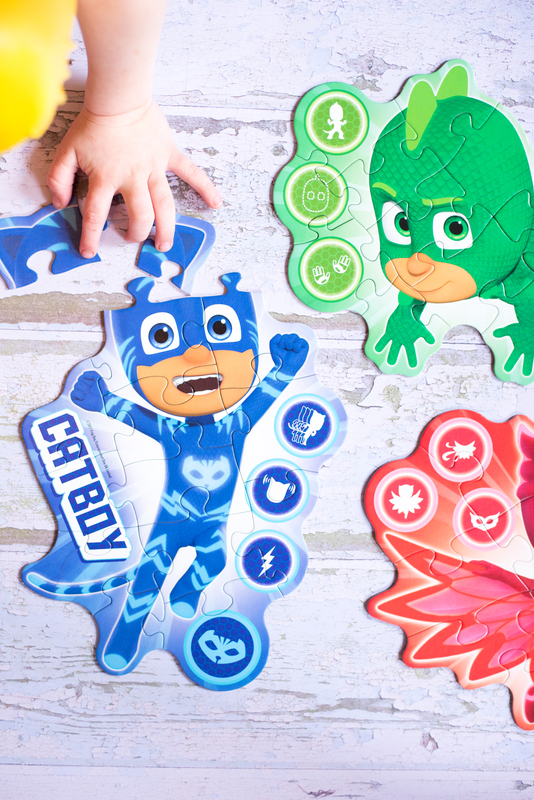 The PJ Masks jigsaws feature the character and name, and little symbols displaying their powers and skills. The little “click” that you get when you pop a puzzle piece together. Apparently, this is a Ravensburger thing! 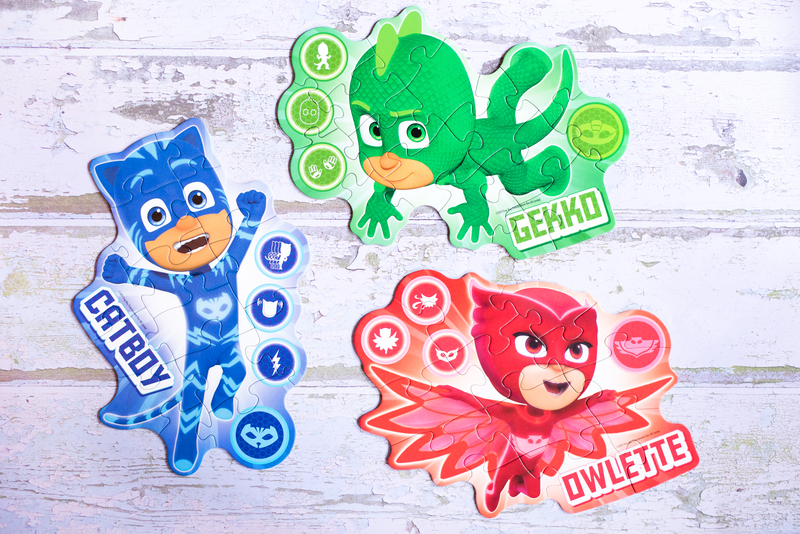 The symbols on the PJ Masks character jigsaws – the boys had great fun trying to name all of them before each other. The linen-like texture of the jigsaw pieces. There’s no huge glare from the jigsaw when the sun shines on it, and the texture makes it easier for little fingers to grip too. That the puzzles graduate in difficulty – from the 10 piece Villains puzzle to Gekko’s 16 pieces. That the puzzles are all different colours and so easy for the boys to sort which pieces belong to each puzzle. That the bad guys are featured! Everyone loves having the naughty people appear. 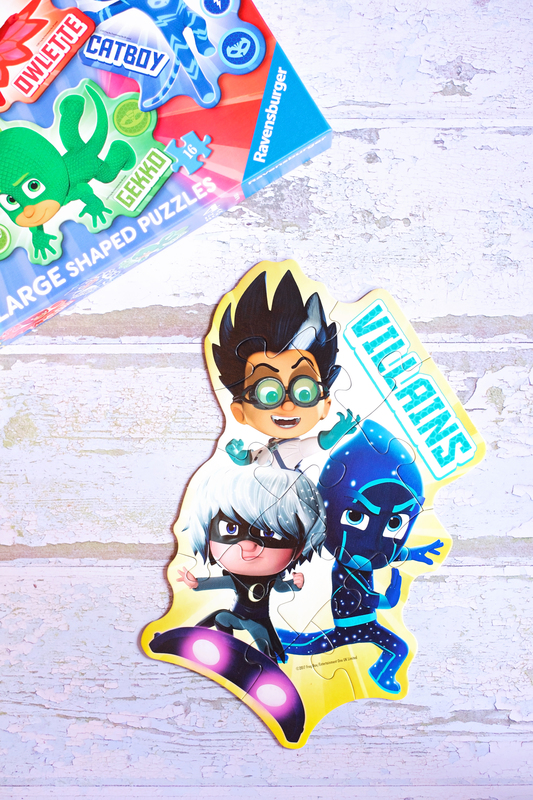 That there were more PJ Masks puzzles with scenes of the episodes in, that would be brilliant. We love collecting Ravensburger puzzles because they’re hard wearing, beautiful and make fantastic gifts. The boxes store well and stack neatly too [a huge plus in my house].